For Parent’s Weekend this year, I needed to choose a restaurant for dinner in my son’s college town. Our extended family was attending the college football game and spending the weekend with our son. Before making my decision, I searched the internet for all the restaurants located within a reasonable distance from where we were staying. I read reviews to see what other people thought of the quality of the food and service. I visited each website and scanned the menus to be sure there were choices that would suit the tastes of some of our “more selective” family members. And finally, I checked for reservation availability for our party. All this information just to decide where to eat dinner! Information is everywhere. 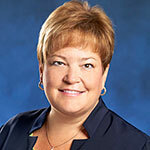 As consumers we want as much information as possible to make all kinds of decisions. As citizens, we would like to think that our government takes the same approach – using all information available to make the best decisions for all types of government operations. Unfortunately, in many cases the operational, tactical and strategic decisions made in government are not based on all of the information that might be pertinent to the situation. Government is no newcomer to Big Data – governments have been collecting and generating vast amounts of data for years. Unfortunately, government information systems have historically been built in silos where data from one government function is held separate from data for other government functions. Through the years, a culture of data ownership rather than data stewardship has evolved. The perceived obligation to control and protect an organization’s data has impeded the ability and willingness to share information across the government enterprise – even when these data assets are critical to improved decisions and services to the public. In the instances where data is being shared, it is often duplicated, transmitted, interpreted and stored multiple times – oftentimes undermining the reliability, consistency, timeliness, and security of the data. The result is redundant data and inefficient decision making. Reduce costs through improved workflows, effective compliance efforts and avoidance of redundant systems and data stores. To better understand the challenges and value of enterprise analytics, join us for Governing magazine’s Big Data Driving Big Results across the Government Enterprise webinar on April 2, 2014. 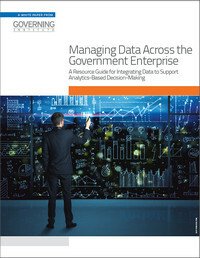 Governing magazine’s white paper Managing Data across the Government Enterprise: A Resource Guide for Integrating Data to Support Analytics-Based Decision-Making provides additional background information and case studies exploring the topic of enterprise analytics.